The capital is the city of Tsu　津市.
. Ise Grand Shrine 伊勢神宮 - Introduction . Mie is home to the Iga ninja　伊賀忍者.
. Ninja Daruma 忍者だるま - Ninja introduction .
. Shrine Futami Okitama Jinja 二見興玉神社 . The Iga Plain is surrounded by various mountain ranges, where the Ninja lived and practised. In October there is a great festival at the Shrine 上野天満宮 Ueno Tenmangu, where local craftsmen and carpenters show their skills in making nine festival floats (roosha, danjiri). The festival originated during an epidemic with the hope to expell the deities of illness and many amulets for health are available at the shrine. 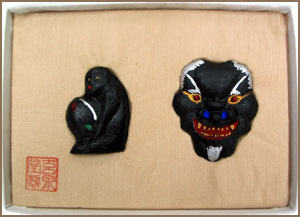 People wear large 能面 Noh-Masks and walk around in an oni gyooretsu 鬼行列 "Demon Procession". 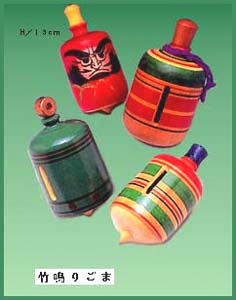 The clay bells, about 14 cm high, represent most of the details of the floats. The clay is fired at low temperatures, so their sound is rather low. The local store 老舗漬物店 has a great collection of these clay bells.
. Matsuo Basho 松尾芭蕉 . was born in Iga, Ueno. And some say he was a Ninja himself . . .
Iga ware comprises ceramic products made in the Iga City area of Mie Prefecture. Using local clay and traditional techniques, Iga ware carries a rich tradition that can be traced back to the Nara Period (710-794), featuring easy-to-hold shapes prized by tea masters and a natural, almost wild beauty actualized by the unique quality of the baked clay. Its beauty is one of a kind—untamed, shining and free. The origins of Iga ware can be traced back some 1,200 years, when peasants in the area began to fire everyday items and agricultural tools. The quality of their products was so highly regarded at the time that there is a Nara Period record of Iga ware being offered to the prestigious Kotaijingu, one of the two primary buildings of the revered Ise-Jingu Shrine. While production fell off in later years, during the Muromachi Period (1336-1573), a potter known as Jiro Dayu revived Iga ware, having such a profound effect that he is now regarded as the founder of its distinctive style. During the Azuchi-Momoyama Period (1573–1603), with the flourishing of wabi-cha (literally, “austere tea”—now known as tea ceremony), the unique and natural style of Iga ware grew in popularity. The fact that the military commanders of Iga Province (the western part of today’s Mie Prefecture) were also tea masters may also have had a strong influence on the development of the craft. With the changing trends and styles of tea ceremony during the Edo Period, Iga ware again fell into decay. However, in the 18th century, craftsmen from Kyoto and areas such as Seto in northern Aichi Prefecture were invited to Iga to produce everyday items that made the best use of the area’s natural resources, thus laying the foundation of modern Iga ware. It was from around this time that Iga ware began to expand from the limited production of tea ware to a wider range of products such as earthen pots, yukihira (glazed earthenware pans with handles) and other tableware. In addition to 3-million-year-old Iga clay, Iga ware incorporates a form of clay known as gaerome, which contains abundant coarse silica particles. When baked, the unglazed pottery is both porous and fireproof, making it excellent for cooking, as excess water can be absorbed from the ingredients to enhance the flavor of the dish. 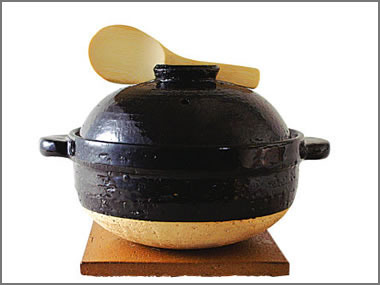 Iga ware is a craft that thoroughly reflects the essence of Mie. Kumihimo are beautiful, braded cords with silk, gold, and silver threads. Most of the kumihimo in Japan are produced here. 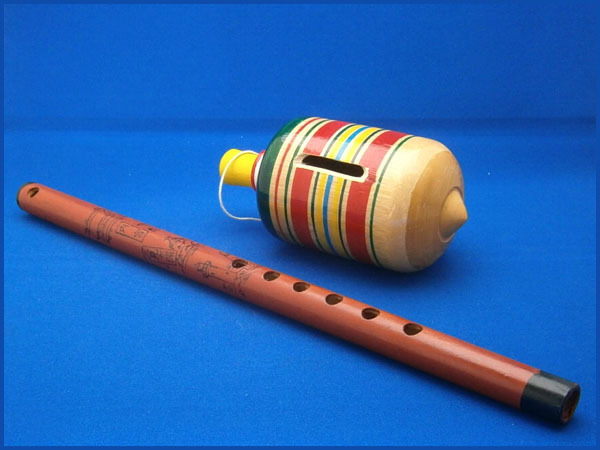 This spinning top is made from wood and bamboo to produce a humming sound when spun. The string is wound around the grip on the top and then pulled. The top begins to spin with the sound of booo ボーッ. They were favorite presents from a visit to the Ise Shrine.
. Take gangu 竹玩具　bamboo toys - Introduction .
. Ise no inu hariko 伊勢の犬張子 papermachee dog from Ise . made with the chips of the woodcarvers and woodworkers of the Ise Shrine buildings. Favorite souvenirs from Ise Shrine since olden times. Many of them are painted red as amulets to ward off disease and evil influence. Most of them have a part that can move, like the mouth of the lion mask or the legs of the octopus. 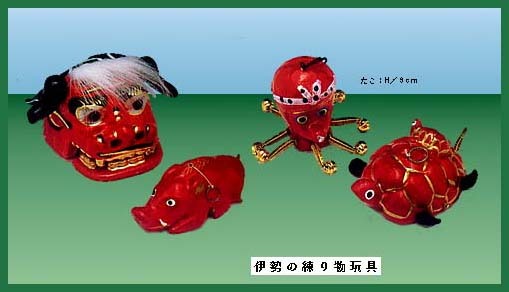 The turtle or wild boar can move around by pulling a string.
. nerimono 練り物 "twisted" clay dolls - Introduction . also called ishinago 石子 / イシナゴ　/ 石投 / 擲石 or mameki　豆木. Made until the beginning of the Showa period. Dice for games played usually by girls. It can also be played with stones and pebbles. This game was already popular in the Heian period. 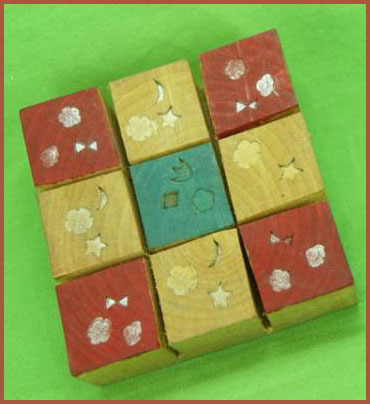 One wooden block is about 4.1 cm wide, the top is decorated with colored patterns of 千鳥 Chidori birds, flowers and others in red and green. It can be broken down to 9 small pieces to play with. The pieces can be used for various games. Throwing one stone in the air and use the same hand to pick up another dices or two or more, in various orders and arrangements, according to special songs. It is a bit similar to the お手玉 Tedama hand-ball game. Issa is referring to ishinadori, a game that is played with little stones. The player would toss a stone in the air, pick up another stone, and then catch the tossed one. Edwin A. Cranston, A Waka Anthology (Stanford Univeristy Press, 2006) 2.411; see also Kogo dai jiten (Shogakukan 1983) 114. In Issa's haiku an expert player is scooping up ten stones at a time. (ishinado) ... similar to the old English game of jackstones. In my translation, I use the more familiar game of marbles. pebble-game falling stones/jacks' one, two, three, four, five, six, seven, eight=noisy world! In the time a jackstone takes to fall . . ? "Four!" "Five!" "Six!" Why must they yell? "Seven!" rhymes heaven but noise is hell! There are degrees of anger. The ancient scholar was irked by the gall of a wet-nurse coming to work with a paltry supply of her goods while Issa was furious about what happened to his documents. The above is an example of Issa mildly angry. It is more a complaint than a maledicta. Issa also had complaints about certain repetitive bird calls getting on his nerves, or geese gaggling when a stroke took away his voice, etc. 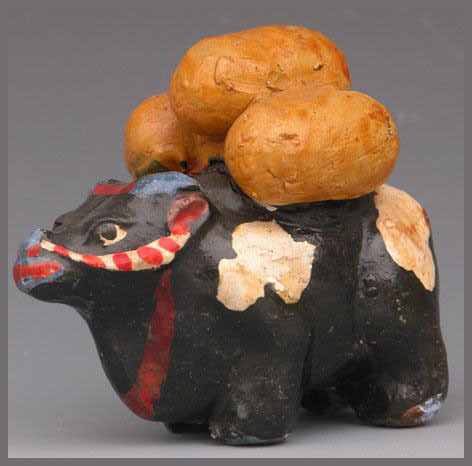 But all are haiku.
. kibikiguruma 木曳き車 car for hauling wood .
. eto 干支 amulets with the zodiac animals . Suzuka is most famous for the productioｎ of Sumi writing ink, right after Nara. The origin of Suzuka-zumi ink is said to date back to the year 780, where the ink was made with soot taken from the burned pine trees that grew in the mountains of Suzuka. Suzuka ink is loved by many calligraphers. In the beginning of 9th century, this kind of ink stick was originally made of soot collected after firing pine trees. Today also, they make ink sticks (smoke black ink stick, blue ink stick and pine tree smoke ink stick) by collecting soot produced by burning plants and putting such materials in wooden molds, as people did in old days.
. sumi ningyoo 墨人形 dolls made from Sumi writing ink . Ise pattern paper is a beautiful paper used for dyeing kimonos, carefully engraved with carving knives. 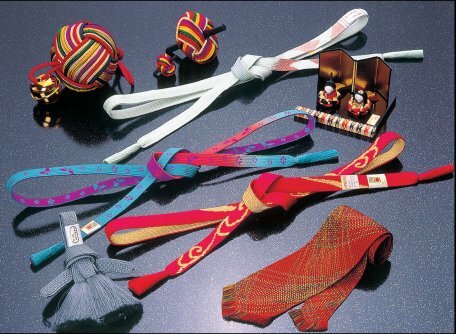 Ise katagami is used as dye pattern for hand printing on fabrics which is said to be initiated in about 8th century. 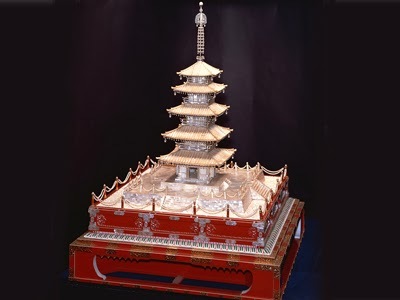 It is made of Japanese style paper bonded in many layers using vegetable glue. On that paper, craftsmen carved sensitive pattern using a fine, sharp edged carving knife. After carving, the cut papers are hardened with lacquer. The carving technique includes file carving, push carving and so on. with katagami - stencil paper from tesuke washi 手漉和紙 handmade Japanese paper treated with persimmon juice.
. katatsukeshi 型付師 pattern maker for Edo komon .
. hajiki saru はじき猿 "repelled monkey" . 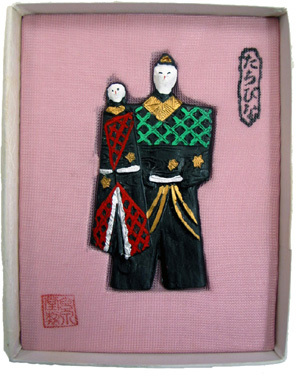 Made by 奥村宗吉 Okumura Muneyoshi. 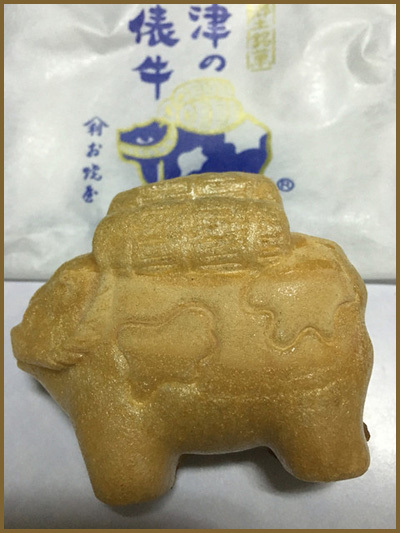 Sold at a store in front of 津観音 Tsu Kannon temple.
. ushi oni, ushioni, gyuuki 牛鬼 "bull-demon" . This monster, a priest of large features and a bald head, is known in various regions of Japan. It is paraded through the town on the shrine festival of Suwa Jinja 諏訪神社 on a special float. This figure was made in a suburb called OKE 桶, as a pun to oobake 大化, big monster. In the soy sauce storehouse of a merchant in Oke village lived an old badger (tanuki), who changed into this Big Nyudo monster and played tricks on people. People drove the badger out of the storehouse and made a big figure on the Nyudo instead. When pulling a string the figure would extend its neck to great length. The badger could not imitate such a feat and finally run away in shame. The festival float is about 2.2 meters high, the figure of the Big Nyudo is about 3.9 meters when the neck is fully stretched. It can show its tongue and roll its eyes to frighten people. There are also small paper dolls now in Yokkaichi as souvenirs. 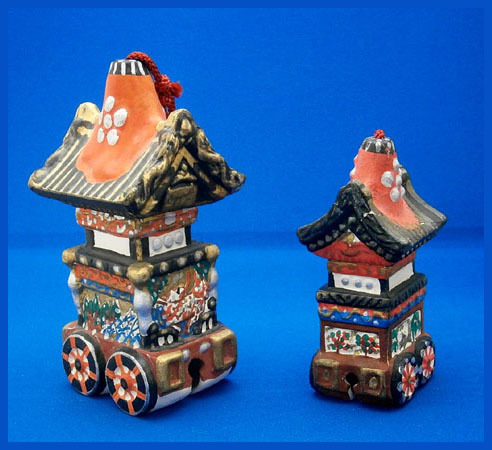 On the People's Festival in August a special mascot of this figure parades through the city.
. Tanuki　狸 Badger amulets .
. O-Nyudo Monsters of Japan - 大入道 .
. Goshiki suzu, goshiki rei 五色鈴 five-colored clay bells . Banko pottery began its own style ever since master potters stamped on their works a wish to have their pieces passed down to future generations, forever. 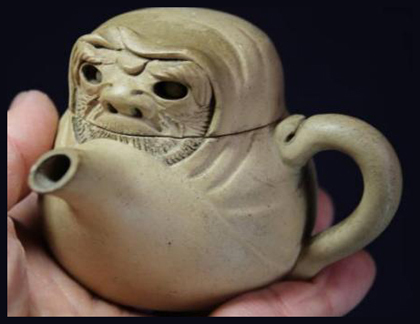 These teapots are very famous.
. Bankoyaki　萬古焼 Banko Pottery - Introduction .
. Mie Folk Toys - this BLOG .